How much money have you spent over the years at the drugstore on another cream or pill that promised you clear skin, only to be disappointed once again? Have you changed your diet and your lifestyle in hopes to banish your blemishes yet you still struggle with angry, painful spots on your face and body? If you feel as though you’ve exhausted your options and balk at thought of wasting more time and money just to be let down again by another failed skincare treatment, then you’ll be happy to learn that there’s still hope for you yet. Keep reading to learn how to finally get smooth, texture-free skin with acne medication. What is the Best Oral Medication? Acne treatments aren’t a generic, one-size-fits-all sort of thing; your response to medication largely depends upon what kind of acne you have. For instance, one type of acne may respond better to one medication versus another. Using the wrong kind of medication can actually make your skin worse, so before starting treatment, consider your type of acne. Also known as “closed comedones, ” these small, non-inflammatory lesions occur when sebum (skin oil) mixes with skin cells and clog the pore. Similar to whiteheads, these small blemishes are also known as “open comedones.” They get their trademark dark color from oxidized melanin. Sometimes comedones get inflamed, leading to papules. Generally small, red, and swollen, these do not have visible pus within them. People often mistakenly call these blemishes “whiteheads, ” but they’re very different. 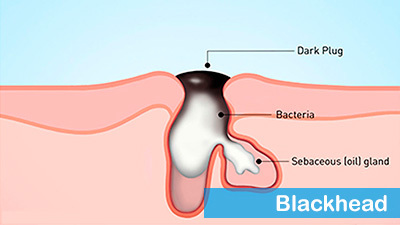 Inflamed and filled with pus, they are typically smaller in size and moderately painful. An extremely severe type of acne, these are usually large and painful to the touch. They can be filled with pus, but may not have visible heads. If not treated carefully, they can scar. Nodules: Very large and deep and painful, these can take months to heal and may need assistance from a dermatologist to remove. Rarely does a person have just one type of acne. Oftentimes, they may have two or more types, but some people, unfortunately, may have all varieties. 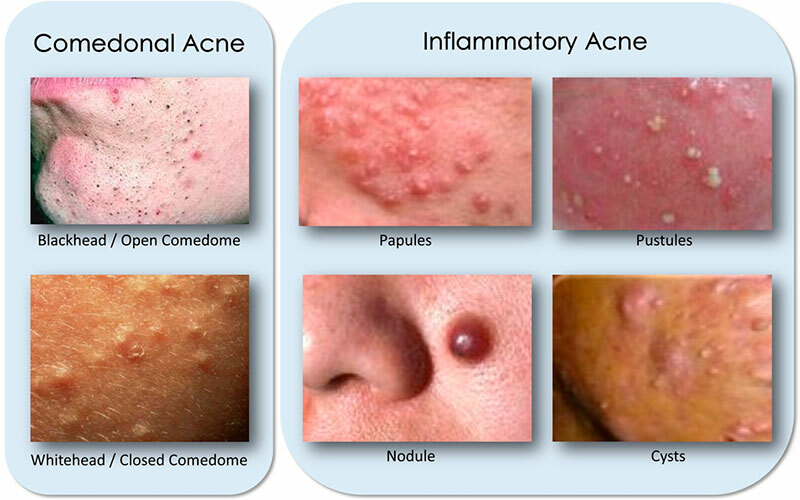 Your type of acne will determine the best medication for your skin. If you have sensitive skin, it’s best to avoid harsh scrubs and creams (including those that contain benzoyl peroxide and salicylic acid) and instead focus more on gentler treatments for your acne. Hormonal Contraceptive: Acne is often caused by hormonal fluctuations, and birth control pills can be a miracle cure for women. 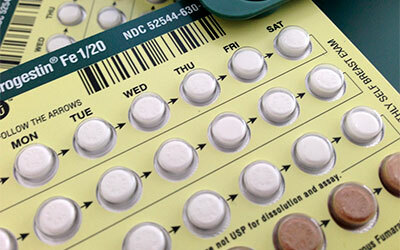 Avoid progestin-only birth control, as it can make your acne worse. Combination pills tend to be more successful. Anti-Androgenic Pills: Again, this treatment is not for men, but are highly effective for women. It helps by controlling hormonal imbalances (such as those caused by polycystic ovarian syndrome) that lead to breakouts. 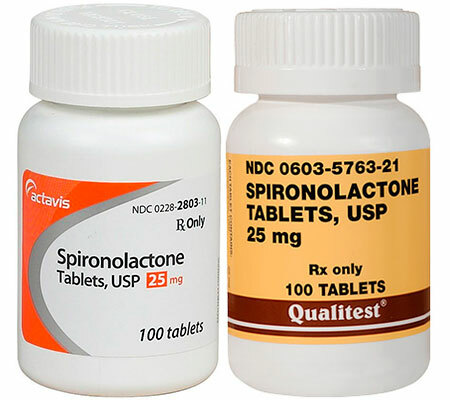 Learn more about the anti-androgenic effects of spironolactone here. 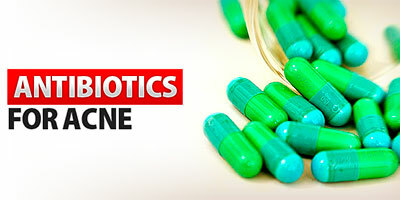 Antibiotics: Both men and women can utilize antibiotics. These come in both pill and cream format and are highly effective. These work by killing the acne forming bacteria (Propionibacterium acnes) and reducing inflammation. 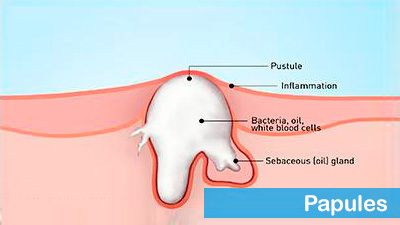 You can read more about antibiotics for acne. 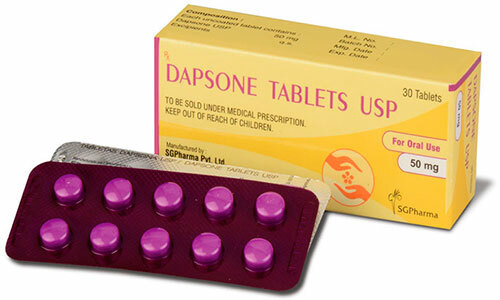 Dapsone: Part of the sulfone family of medicine, this was originally created to treat leprosy but doctors quickly discovered it reduced acne lesions in patients. It can be in either oral or topical form and is very gentle. These treatments are powerful and non-irritating, making them a good choice for those with delicate skin. Oily skin tends to be a little more responsive to stronger treatments, but you still want to be gentle with your skin. 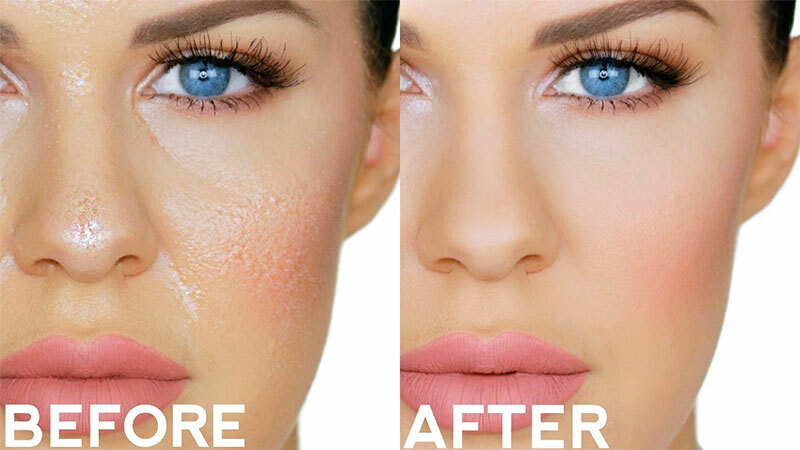 Overly harsh scrubs can strip your skin, causing it to overproduce oil in response, making your problem worse. Retinoids: After applying moisturizer, follow up with a pea-sized dollop of either tretinoin or adapalene. Click here to learn more about Tretinoin. Start by using 2x per week and work up to using every night. Salicylic Acid: This medication works best immediately after cleansing skin. Be sure to moisturize afterward with a non-comedogenic cream. 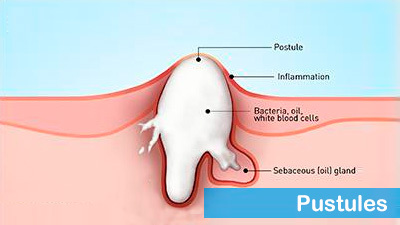 Benzoyl Peroxide: Use the lowest dose possible (1-2.5%) to avoid irritation. Smooth onto freshly cleansed and moisturized skin at night. Dapsone: This isn’t just for people with sensitive skin! Just because it’s gentle doesn’t mean it’s not effective. Click here to learn about how to take minocycline correctly. Many of these treatments can actually reduce your skin’s oil production, leading to smoother and clearer skin. It may come as a surprise that people with dry skin can also suffer from acne. The fact is, having acne and dry skin concurrently is more common than one might think. People with dry skin may have a damaged acid mantle, the outer layer of skin that is comprised of fatty acids and sebum. Keeping the acid mantle healthy is critical to avoid chronic skin disorders like acne. To avoid further irritating your already dry skin, adopt a gentle skincare regimen. Gently massage non-foaming cleanser onto your skin. Rinse off with lukewarm water. Avoid hot water, as it can be harsh and drying. Lightly pat your skin with a soft, microfiber towel. Apply a thick layer of non-comedogenic moisturizer onto your face and let sit for five minutes. 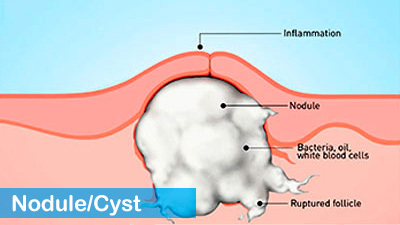 Follow with a gentle acne cream, such as topical antibiotics or dapsone. Learn more about acne pills here. If you follow this skincare routine closely, you can successfully reduce your acne lesion count without further stripping or irritating your already dry skin. Not all OTC acne medicines are rubbish; many are effective, but most people are unaware of which ones are good and which ones are simply a waste of money. Salicylic Acid: A powerful exfoliant, this ingredient works by unclogging pores and helping your skin shed dead skin easier. Sulfur: This reduces excessive oil and helps promote exfoliation, leading to a reduction in clogged pores. Benzoyl Peroxide: This ingredient is antimicrobial, killing the acne-causing bacteria on your skin’s surface. Alpha Hydroxy Acid: Also exfoliating, AHAs include lactic acid and glycolic acid. They also reduce inflammation and encourage healthy new cell growth. Recently, adapalene has been made available over-the-counter. As retinoid, it works by exfoliating away dead skin and encouraging cellular turnover, leading to the clear, bright, and healthy skin. Avoid getting these medicines near your eyes. Start with a lower dose treatment to prevent unwanted irritation, then increase if your skin seems to tolerate it well. Avoid excessively washing your face to prevent irritating your acid mantle. 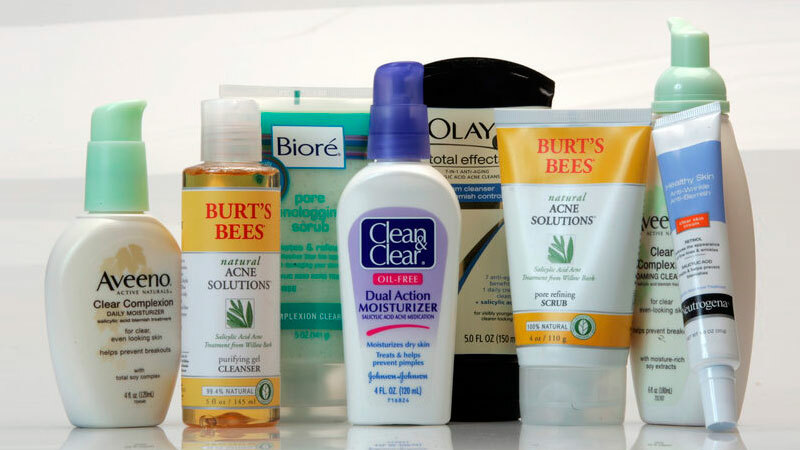 Don’t use too much product – too much of a good thing can actually make your skin worse. Resist the temptation to skip moisturizer, as your skin may be sensitive after starting a new protocol. Do not pick at your face. You may see dry skin flakes or blemishes, and picking can delay healing. Be patient and open-minded about experimenting with treatment. What works for one person may not work for you. By looking for these key recommended ingredients and following the advice outlined, you can avoid prolonging your acne suffering. When you feel as though you’ve tried literally every OTC acne product on the market, then eventually you must acknowledge that you need to consider prescription acne medications. These products can only be given to you by a doctor via prescription and are not available over-the-counter at big-box supermarkets or drugstores. These medicines are more powerful and are almost guaranteed to give you the clear skin you desire. Depending on your type of acne, your doctor may advise a combination therapy for your skin. For instance, antibiotics work extremely well against inflammatory acne lesions such as pustules and cysts, but they aren’t as successful against comedonal acne. To reduce whiteheads and blackheads, you may need a retinoid. Antibiotics are some of the most potent anti-acne medicines. Your doctor may prescribe them to combat your inflammatory spots due to their antimicrobial and anti-inflammatory properties. 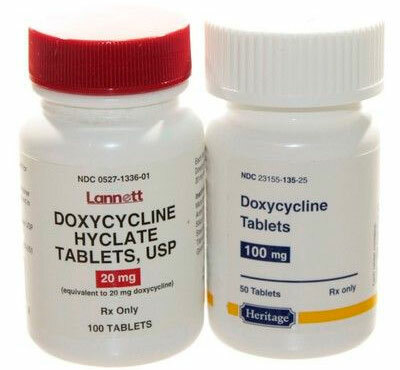 Learn more about using doxycycline for your acne here. If your dermatologist prescribes antibiotics, be sure to take it exactly as advised. Even if you see a reduction in your acne, do not stop it until your doctor tells you to stop. While rare, occasionally life-threatening allergic reactions can arise when taking acne medications. These can occur even when you have no history of allergies. Symptoms of an allergic reaction include itching, swelling of throat and tongue, hives, severe dizziness, and trouble breathing. If you experience any of these symptoms, stop taking the medicine immediately and contact your physician. Failure to adhere to your treatment regimen can lead to antibiotic resistance and a relapse and even worse acne in the long run. There is one secret pill that doctors are keeping in their back pocket. When all other treatments fail, a doctor will finally recommend this medication. However, despite being arguably the most potent acne medication on the market, it comes with a host of side effects, making many doctors hesitate before prescribing it. If you’ve tried everything else and have not gotten clear skin, then you may be a good candidate for isotretinoin (also known as “Accutane”). Most patients who take isotretinoin achieve complete remission from even the most severe acne. If your doctor recommends isotretinoin to you, then don’t be alarmed. Many people have heard exaggerated horror stories about this pill and may have trepidation about taking it. Follow your doctor’s advice when taking it, have routine bloodwork taken monthly to ensure your levels are healthy and use two forms of contraceptive to avoid unwanted birth defects. If you have any concerns, contact your physician. While this medication is mostly safe, your doctor will let you know if you are a good candidate or if you need to cease treatment. Topical acne medicines are best for people who may be anxious about the side effects of taking pills. While topical acne medicines do have side effects, they may be better tolerated versus oral pills. AHAs, BHAs, Sulfur, and Benzoyl Peroxide. If they become particularly bothersome, consult your dermatologist about changing your prescription to something that may be easier on your skin. Clear skin is possible for you. Even if you feel defeated by your acne, there are still powerful treatments available for you both over-the-counter and from a dermatologist. If you’re still struggling with unsightly, painful blemishes, consider asking your doctor for a strong acne medication that can give you the relief that you so strongly desire.